On day two of a series of protests called “FERCus,” activists played a cat-and-mouse game with police, starting out early in the morning at the Federal Energy Regulatory Commission, proceeding to the U.S. Department of the Interior and then returning to FERC by midday. They began with an early morning sit-in at FERC as employees arrived at work. Later, they ducked into the Metro, confounding police who were closely following their movements. Southern states see a bonanza, environmentalists see mixed signals from Obama on climate change as moratorium ends after almost three decades. 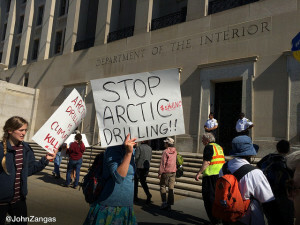 The Obama administration announced plans Tuesday to open up parts of the Arctic and waters off the mid- and south Atlantic coasts to drilling. The contentious new plan, unveiled by the Interior Department, proposes 14 potential leases between 2017 and 2022 in parts of the Arctic, Gulf of Mexico and off the coasts of Virginia, Georgia, North Carolina and South Carolina. The leases open up drilling on nearly 80 percent of undiscovered, potentially recoverable resources off the nation’s outer continental shelf. Drilling remains off-limits off the Pacific coast, where political opposition to offshore oil and gas exploration has long been fierce. Some areas of the Beaufort and Chukchi seas off the Alaskan coast—which the administration deemed “simply too special to develop”—have also been banned from leasing. Here’s a map of the areas that were previously open to drilling and the new areas proposed for leasing. Click to enlarge.